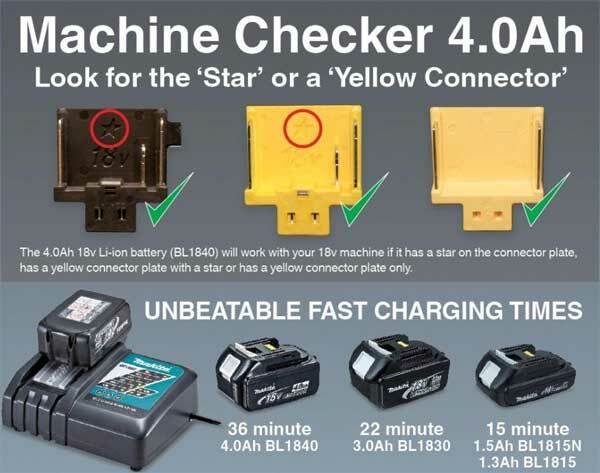 46 minute charge time - 18v 5.0Ah Li-ion batteries charge with existing DC18RA and DC18RC chargers with an unbeatable 46 minute charge time. Through this two way communication between charger and battery, the charger can recognise the battery and recall its charging history analyse the batteries condition and usage and charge the battery accordingly. Same size and weight as 4.0Ah - The weight saving means that Makita can have 5.0Ah from a battery weighing the same as a 4.0Ah. Not only is it the same weight but also you will have much more power and a longer lasting battery life.